All these topics will be addressed in this document. Dandelion-Core is mainly based on a Filter which dynamically injects assets into HttpServletResponses, that is - HTML pages. Dandelion-Core is therefore considered as a runtime solution (as opposed to build time solutions provided by other frameworks/libraries). Dandelion-Core reads a set of bundle definitions, either embedded within existing components, directly provided by end-users or both, and represented in the JSON format. Once these bundle definitions consumed, Dandelion-Core builds a directed acyclic graph of bundles (or bundles graph later in this document) and binds it to every requests made against the web application. As soon as the end-user requests a bundle, using any of the provided ways (JSP taglib, Thymeleaf dialect, …​), Dandelion-Core traverses the bundle graph to extract all corresponding assets and then injects <script> ans <link> tags into the HTML page. Since Dandelion-Core have full control over these assets, many actions can be performed such as asset versioning, browser caching, and many more. The list below covers the common steps across all supported template engines. Depending on the template engine you wish to use in your web application, add either dandelion-jsp or dandelion-thymeleaf to your project’s dependencies. 1 Note that all dispatcher types should be specified in order for the filter to work in any situation. An assets bundle, or bundle to simplify the language, is a logical group of assets. No. Can be inffered from the file name. No. Can be inferred from the first found location. As soon as the app bundle is requested, all assets contained in the jquery bundle will be loaded before app.js since the jquery bundle is marked as dependent. All assets intented to be used in your web applications need to be known by Dandelion. As a consequence, you have to create bundles accordingly, in a declarative approach. Each bundle is basically a JSON file, located under the classpath_root/dandelion folder. 1 the jquery asset is configured with the remote location key. This key is mapped to a particular asset locator used by Dandelion-Core to know the fetching strategy to use. Read more about asset locators. 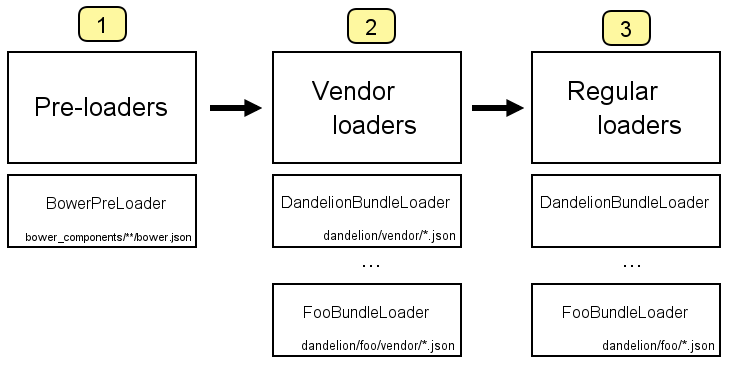 Dandelion will load all bundle definitions in a particular order, using bundle loaders. See the bundle loaders section for more information. As bundles are scanned, Dandelion stores them internally as a directed acyclic graph or DAG, which is used to implement the relationship of dependency between bundles. This DAG will be considered as bundle graph in the rest of the documentation. 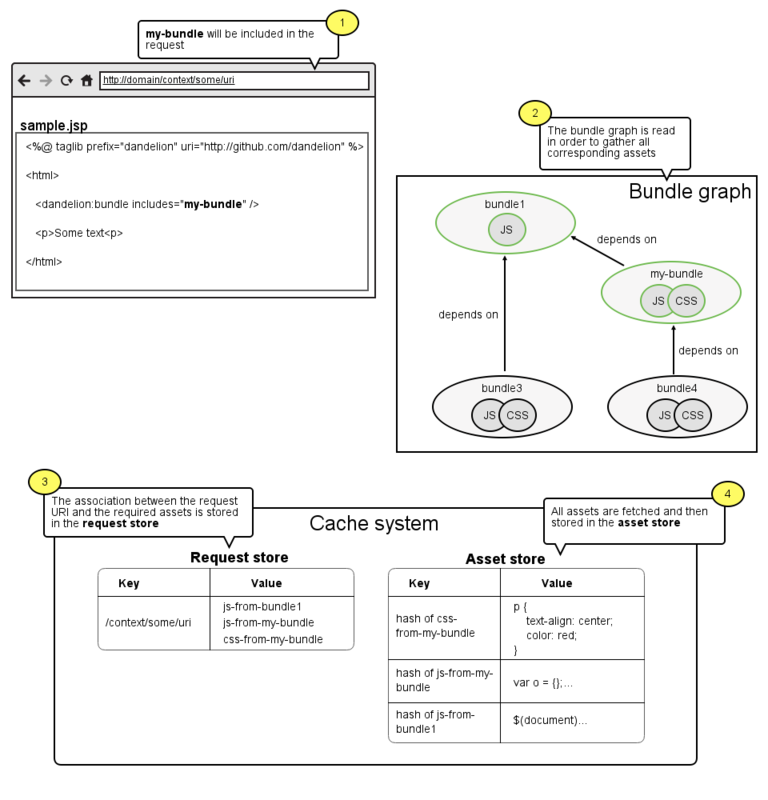 The bundle graph is built implicitely, depending on the bundle definitions and specifically their dependencies. Assume the following bundles: jquery, datatables and bootstrap2. Dandelion applies some storage rules in order to keep consistency between bundles. All of theses rules are checked at startup, more precisely in the init(FilterConfig) method of the DandelionFilter and are described below. An exception is thrown as soon as a cycle is detected among your bundles. First for performance concerns, even if the bundle loading phase is very fast. But mostly for maintenance concerns. The more bundles you have, the harder the maintenance will be over the time. There are many ways to include a bundle in a request, each of them are described below. The <dandelion:bundle> tag is designed for this purpose. You can include one or more bundles into the HTTP request by using the includes attribute of the <dandelion:bundle> tag. In the same way, use the excludes attribute to excludes bundle from the current request. You can also interact with the graph at a more fine-grained level, by directly removing assets from the HTTP request. The <dandelion:asset> tag is designed for this purpose. As a consequence, only the asset called asset1 will appear in the HTML source code. The ddl:bundle* attributes are designed for this purpose. You can include one or more bundles into the HTTP request by using the ddl:bundle-includes attribute on any HTML tag. In the same way, use the ddl:bundle-excludes attribute to excludes bundle from the current request. You can also interact with the graph at a more fine-grained level, by directly removing assets from the HTTP request. The ddl:asset* attributes are designed for this purpose. 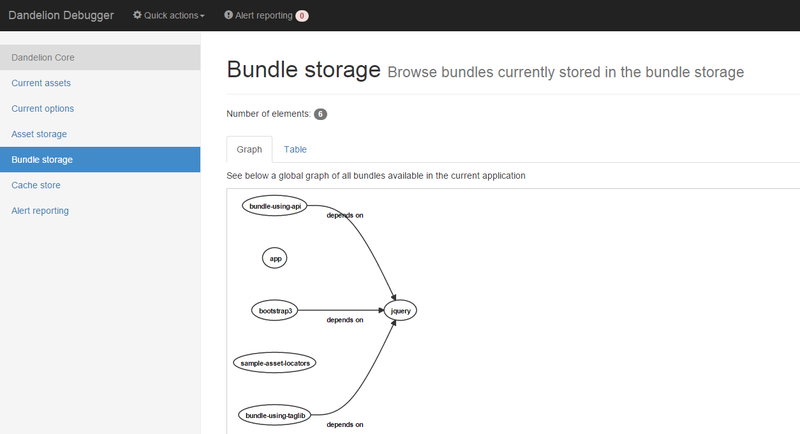 The bundle graph can also be accessed using the Dandelion API. This is how components, such as Dandelion-Datatables, interact with it. The only requirement is that you have access to the HttpServletRequest API. You can then use the AssetRequestContext object, an utility made available for accessing the bundle graph. Some configuration options allow you to interact either with bundles or assets but in a wider scope than the HTTP request. Sometimes it might be useful to load some assets in all web pages of the application, e.g. some CSS directives. Some configuration options has been designed for this purpose. In order to include one bundle permanently, use the bundle.includes option. As a consequence, the bundle-to-include bundle will be included in every HTTP request. And for some reason, if you need to do the opposite, you can exclude bundles from the application by using the bundle.excludes option. With the above option, all assets contained in the bundle-to-exclude bundle will be excluded from all requests. Similarly you can permanently exclude assets from the application. 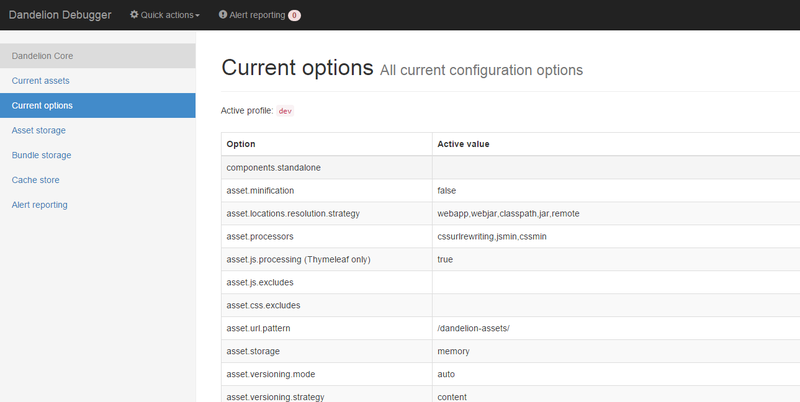 Two configuration options are available: asset.js.excludes and asset.css.excludes. With the above configuration options, the CSS app asset will be always excluded from any request. Assets can be fetched from different location thanks to asset locators. This section describes how it works and the available asset locators. Depending on the locator, Dandelion generates the right URL to serve the asset directly from the location where it lives. For example, all assets present in the webapp directory are defaultly served by the webapp itself. In this case, Dandelion will just process the given location by prepending the context path and no caching is necessary. However, an asset stored in the classpath for example, cannot be served directly by the webapp. Instead, in such a case, Dandelion fetches its contents and stores it in the configured cache system, with a particular cache key. Later, the generated link pointing to this asset will be served by the DandelionServlet, the role of which is to retrieve its contents from the cache system and serve it. See the asset caching section for more information. The most obvious case is to configure an asset with a single location. In the above bundle, Dandelion will always use the single remote location to fetch the asset. In cases where multiple locations are configured for a single asset, Dandelion uses a particular strategy to resolve them. It simply reads the asset.locations.resolution.strategy option from your configuration file and checks if a location is present for a specified set of locators. First checks if a webapp location key is specified. If so, the corresponding location will be selected and processed. If none of the above is specified, an exception will be thrown. In such a case, thanks to the default resolution strategy, Dandelion will first prioritize the webapp location. Combined with profiles, this feature is powerful enough to handle multiple locations in multiple environments. Dandelion comes with a couple of built-in locators. They are all listed below. The webapp locator should be used whenever you need to load an asset stored in the web application directory. The classpath locator should be used whenever you need to load an asset stored in the classpath. The remote locator should be used whenever you need to load an asset hosted externally, e.g. on a Content Delivery Network or any other media server. The jar locator should be used whenever you need to load an asset stored inside a JAR, under the META-INF/resources folder. Consider a JAR in which some assets live in the META-INF/resources folder. This locator is bundled in the dandelion-webjars extra since it brings a new dependency to the webjars-locator project. This project is internally used by the webjar locator to locate assets inside WebJars. The webjar locator should be used whenever you need to load an asset stored inside a WebJar. The api locator should be used for generated assets, i.e. assets whose contents is programmaticaly generated. This locator, instead of fetching an external asset, will simply call the getAssetContent(HttpServletRequest request) method of AssetContentGenerator. See the asset generators section for more information. Let’s consider the following bundle, containing a single asset which is configured with the api location key. The file locator should be used whenever you need to load an asset stored in the local file system. Like most parts of the framework, you can use your own asset locator thanks to the SPI mechanism. And that’s all! Dandelion, thanks to the SPI mechanism, will automatically pick up your implementation on the next restart. Versioning of assets is not only an important aspect of optimizing for performance, but can also be critical for correct functioning of your application. In order to facilitate the versioning, Dandelion-Core provides two modes: manual and automatic. The automatic versioning mode is based on different strategies: either based on the contents of each asset or on a fixed version. Each of these strategies are detailed below. Note that this is the default mode for all non-vendor assets. The manual versioning mode relies on bundle definitions, in which assets can have a version attribute. In such a case, the asset version is just read from the asset’s attributes and is applied during the generation of <script> and <link> tags. The versioning of vendor assets (assets located in vendor bundles) is always manual, i.e. read from the bundle definitions. This strategy consists of generating a fingerprint for each asset, based on its contents. This technique is also known as fingerprinting or cache busting. The fingerprint, which simply is a MD5 hash, is inserted into the asset name. When the asset is static or infrequently changed, this provides an easy way to tell whether two versions of an asset are identical, even across different servers or deployment dates. When the asset content change, the fingerprint is updated. This will cause the remote clients to request a fresh copy of the asset. In combination with the right caching headers, this is the most powerful technique for better web performance. See the asset caching section for more information. This strategy consists of using a fixed version for any asset, for example a date, a global version number from a property file, a Jenkins build number or anything else. Used in combination with Maven filtering, you could filter the dandelion.properties configuration file and use a global version among all your assets. Dandelion provides some processors intended to be applied on assets. This section introduces major concepts around these processors. Most of the existing processors are used to minify assets. Dandelion-Core already provides some built-in processors which are auto-configured depending on the active profile. See below for more information. Asset processors are configured via the asset.processors configuration option. You just need to define a comma-separated list of processor keys to enable the corresponding processors on all assets. For example, the default value is in the prod profile is cssurlrewriting,jsmin,cssmin. This means that by default, the corresponding processors will be applied sequentially on all assets, depending on their type. The asset processing is enabled thanks to the asset.minification configuration option. Set it to true to minify all assets using the configured processors. Set it to false and all assets will be served as-is. Asset naming: the min keyword is automatically appended to the asset name, just before its extension. For example, an original asset called app.css will be served as app-[MD5HASH].min.css. Asset caching: once processed, all assets will be cached in the configured cache system, and then served by the DandelionServlet. This processor uses a fork of the Yahoo’s YUI Compressor authored by Andrew Roberts. This processor processes all relative paths in CSS and replaces them by absolute ones according to the number of occurrences of ".." counted. This processor is based on a translation frop C to Java of jsmin.c published by Douglas Crockford. // Mozilla 4. Netscape 6 claims to be version 5. Bundles fall into two categories: vendor and regular. All vendor bundles are supposed to reference vendor assets or libraries such as jQuery. Regular bundles are supposed to reference all other assets, in particular all assets developed and maintained by yourself for your application. This disctinction is important because Dandelion doesn’t behave in the same way with vendor and regular bundles, especially in terms of versioning, processing and loading. Since v1.1.0, new pre-loaders have been introduced, particularly to provide integration with package managers such as Bower. All pre-loaders are invoked first. Pre-loaders will scan for all components downloaded using package managers and convert all these components as vendor bundles. Note that all pre-loaders can be disabled thanks to the bundle.pre.loaders option. This particular order ensures that vendor bundles are always loaded in first and may be easily overriden by end-users using custom bundles. Starting from Dandelion-Core v1.1.0, Dandelion provides an integration with Bower components. The integration consists in scanning the downloaded bower_components folder for all bower.json manifests. Once scanned, all manifests are automatically converted into vendor bundles. First, it checks if the bower.components.location option is set in the configuration file. 1 The location here refers to a folder within the web application directory. But it can be configured. or you can simply let Dandelion use the scanning strategy (TODO LIEN) and the bower_components folder will be scanned. 1 In other words, you prefer to save the Bower folder within the classpath. Both classpath: and file: prefix are supported. With the file: prefix, you must specify the absolute path of the bower_components folder. You may wish to write an extension that uses its own bundle loader, e.g. if you wish to scan for bundles somewhere else than in the classpath. You might also need to use your own pre-loader. Let’s see here how to do it. And that’s all! Thanks to the SPI mechanism, Dandelion will automatically pick up your implementation on the next server restart. And that’s all! Thanks to the SPI mechanism, Dandelion will automatically pick up your implementation and add it to the active bundle loaders on the next server restart. Fetching something over the network is both slow and expensive: large responses require many roundtrips between the client and server, which delays when they are available and can be processed by the browser, and also incurs data costs for the visitor. As a result, the ability to cache and reuse previously fetched resources is a critical aspect of optimizing for performance. Caching is one of the key issues of Dandelion-Core. Caching is involved at multiples levels, from server-side core functionalities such as asset locators to client browsers thanks to HTTP headers. All caching mechanisms are described in this section. As you can see, a new entry is added in the request store on a per-page level. This looks quite aggressive but works in all cases. More fine-tuned strategies will be available in future versions. As far as possible, Dandelion-Core helps the browser determine if and when it can reuse a previously fetched response. For this to happen, Dandelion-Core acts on server responses by specifying an explicit caching policy for each resource. The caching policy is set through HTTP headers, whose value changes depending on the cache option. The caching policy of resources fetched from external locations, such as CDNs, is delegated to the external servers. The HTTP headers are set on all resources except those with the text/html content type. Dandelion-Core comes with two built-in server-side cache systems that are described below. Dandelion uses the MemoryAssetCache service provider as the default implementation used for server-side caching. This implementation uses two maps as stores, that use the LRU algorythm for the eviction of elements. The first one caches asset contents. The max element of each of them can be configured thanks to the cache.max.size configuration option. Alternatively, if you already use Ehcache in your application, it can be handy to use it as a main cache system for Dandelion-Core. Once the artifact available in your classpath, you need to tell Dandelion-Core that you want to use the service provider bundled inside. Moreover, note that you can specify the location of the ehcache.xml file using the cache.configuration.location configuration option. Like most parts of the framework, Dandelion-Core provides an extension point allowing your to plug-in your own cache system thanks to the SPI mechanism. Configure Dandelion-Core to use your custom implementation thanks to the cache.name configuration option. Dandelion profiles provide a way to segregate parts of your configuration and make it only available in certain environments. For now, only system property-based activation is supported. All existing configuration options are created with two values, one for the built-in dev profile, another for the prod one. Each of these profiles are described below. The main goal of the dev profile is to accelerate the development. As such, it is active by default. This profile can be activated thanks to different aliases: dev and development. The prod profile is focused both on performance and security. That is why it should be active in a production environment. See the configuration options reference for the complete list of prod values. This profile can be activated thanks to different aliases: prod and production. Note that profiles can also contain custom properties in order to use them in bundle definitions. This is particularly useful to handle deployments in multiple environments. Consider the two following profiles: qa and prod. Dandelion will perform the configuration substitution as soon as the application server starts. All options not explicitely declared in your own profile file will be read from the built-in dev profile. One of the great features of Dandelion-Core is the ability to generate code. This feature is particularly handy when developing components such as Dandelion-Datatables, which require some code to initialize a client-side library. This implementation can be used as-is. If so, all you need is to instanciate AssetContent directly or to use a custom implementation where the contents of the asset must be returned by the getContent() method. The most important part here is the configured location: uid. Indeed, Dandelion-Core will look inside the current HttpServletRequest if an instance of AssetRequestContext is present. This utility is particularly useful to interact with the Dandelion context: include/exclude bundle, exclude assets AND configure asset generators. Finally, as soon as Dandelion-Core detects an api location key, it will look for a generator inside the current AssetRequestContext under the configured uid and invoke its getAssetContent() method. One of the key features of Dandelion-Core is that it is highly configurable. Plenty of options, with default values depending on the active profile, are at your disposal to configure the framework. See the configuration options reference for an exhaustive list of available options and their corresponding default value with both dev and prod profiles. By default, Dandelion-Core expects a file called dandelion.properties to be located in the classpath-root/dandelion folder. Note that when a profile is explicitely activated, Dandelion will try to load a file called dandelion_[profileName].properties. See the profile section for more information. Dandelion-Core can also load an externalized configuration file, using the dandelion.configuration System property. In order to read the externalized file, just add the -Ddandelion.configuration System property to the server starting script. All Dandelion configuration options can be set in different ways. Dandelion-Core ships some live debugging tools that you may find useful during development. Since Dandelion-Core relies on asset bundles, it is extremely important to have quick feedback on potential errors when including bundles. Since the v1.0.0, Dandelion-Core has a basic alert reporting tool that will help you to debug as fast as possible. For now, only missing bundle will be reported but it will be enhanced in future versions. The choice is set via the tool.alert.reporting.mode configuration option. All alerts are reported in a dedicated debug page, inside the debugger. See the next section for more information. The reporting system can be enabled/disabled thanks to the tool.alert.reporting configuration option. In order to access the debugger, just append the following request parameter to the current URL: ddl-debug. For example, if you are browsing the JSP starter sample at the URL: http://localhost:8080/core-jsp-starter/, just modify the URL as follows: http://localhost:8080/core-jsp-starter/?ddl-debug. As a consequence, Dandelion-Core will display the debugger and show information about the current request. Access to the debugger can be disabled thanks to the tool.debugger configuration option. The Dandelion debugger is composed of several debug pages, which are described below. Note that the tabular view also displays more metadata about bundles: the original bundle loader (note that a vendor tag is displayed for vendor bundles), all bundle dependencies and the bundle original path. This debug page lets you visualize the contents of the cache store, that is all associations between request URIs and required assets. This debug page lets you visualize all alerts reported by Dandelion-Core. Note that when a requested bundle doesn’t exist in the bundle storage, Dandelion-Core checks whether any bundle exists with the same name. If so, all suggested bundles will be displayed in the last column. As briefly explained in the introduction, Dandelion-Core is mainly based on a servlet filter: DandelionFilter. As most of existing filters, it is used to preprocess requests and postprocess responses, but in a modular manner that will be described in this section. The DandelionFilter does not directly processes requests and responses but delegates to a set of handlers. As the filter chain of the Servlet API, Dandelion-Core builds a handler chain at startup, which provides the same kind of mechanism as filters but for invoking a series of handlers, in a particular order. Each handler has its own role, which will be detailed in the next section. Note that the debugger has a Quick actions menu that trigger the bundle reloading using the above parameter. Note that the rank of built-in pre-handlers doesn’t matter, since they’re all used to perform one shot actions. This handler is automatically registered when using Thymeleaf. And that’s all! Thanks to the SPI mechanism, Dandelion will automatically pick up your implementation and insert it in the handler chain at the position defined by its rank. The <dandelion:bundle> tag allows you to include bundles in (or exclude them from) the current HTTP request. The <dandelion:asset> tag allows you to exclude assets (JS and/or CSS) from the current HTTP request. The <dandelion:placeholder> tag allows you to configure custom placeholders that Dandelion-core will use to perform assets injection. By default, Dandelion-Core injects <script> tags at the end of the <body> section and <link> tags at the end of the <head> section. But in the example below, the injection is performed where the <dandelion:placeholder> tag is used. The ddl:bundle* attributes allow you to include bundles in (or exclude them from) the current HTTP request. Both ddl:bundle-includes and ddl:bundle-excludes attributes can be used on any HTML tag. The ddl:asset* attributes allow you to exclude assets (JS and/or CSS) from the current HTTP request. As ddl:bundle* attributes, ddl:asset* attributes can be used on any HTML tag. The ddl:placeholder* allows you to configure custom placeholders that Dandelion-core will use to perform assets injection. By default, Dandelion-Core injects <script> tags at the end of the <body> section and <link> tags at the end of the <head> section. But in the example below, the injection is performed where the <ddl:placeholder*> attributes are used. Placeholder where to inject the specified asset type. 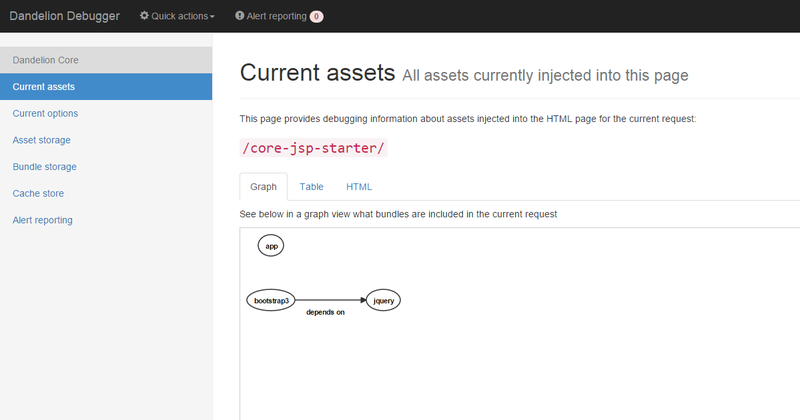 Assets will be injected into the corresponding element. Placeholder where to inject the specified asset type. Assets will replace the corresponding element. The table below lists all available configuration options. Allows components to be used standalone. If a component is used standalone, its corresponding bundle loader will be disabled. Comma-separated list of location keys. See the asset locators section for more information. Path to a configuration file used by a third-party cache system, e.g. ehcache.xml. Enable/disable all pre-loaders. See the bundle loader section. Location of the bower_components folder. See the Bower integration section.